This week, we look at one of the most decorated and hated decks on the ladder today. 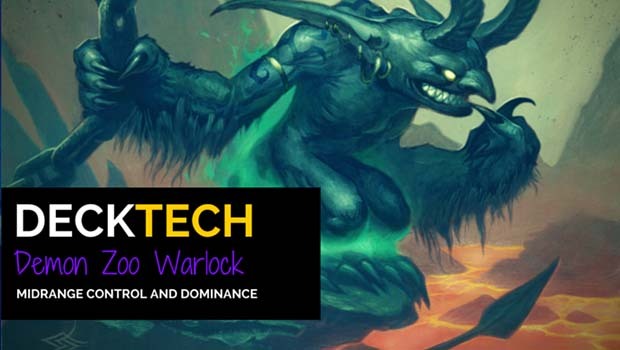 Warlocks continue to be both a tournament and ranked ladder staple. It’s a deck that continues to be popular because it originated as an easily affordable deck that anyone can put together. It has gone through some changes and some new cards were introduced in Goblins vs Gnomes and Blackrock Mountain to spawn a fork of the original deck. There’s the traditional Warlock Zoo deck where the most expensive minion is a Doomguard, but the one being shown here today is the Demon Zoo version with Mal’ganis as a finisher. Origin of Zoo: In Magic: the Gathering, a Zoo deck is defined as an extremely aggressive deck which abuses buff cards with damage spells and utility. Instead of relying on a few late game power minions, Zoo decks hinge on a team of minions in order to maintain and enforce board superiority. One of the popular Zoo decks was a Red, Green, and White deck (called Naya) in Magic with creature cards like Kird Ape, Savannah Lions, and Gorilla Shaman backed by spells like Lightning Bolt, Chain Lightning, and Swords to Plowshares. Incidentally enough, that’s why it was called zoo: Apes, lions, and other assorted animals. At first glance, Zoo might seem awfully similar to Face hunter largely due to the cheap minions. A Face hunter deck relies on numerous cheap and aggressive minions to batter away at the opponent while relying on their Steady Shot hero power to chip away. However, the Warlock Zoo deck here will be using the minions to completely dominate the board first. There will be times when you have the opportunity to go send your Sea Giant into your opponent or knock off a Loatheb or a similar threat from the board. 8 damage to your opponent is nothing to shrug at especially if it puts you in range of lethal next turn with any Doomguard, any Power Overwhelming, or so forth. League of Explorers Update: Dark Peddler is amazing. The Discover mechanic provides you with multiple cheap 1-mana cost options and Warlocks have some of the best 1-cost spells and minions in the game. Soulfire and Power Overwhelming alone can potentially provide you with extra burst. Consider dropping a Doomguard and a Sea Giant to squeeze a pair of Peddler’s into your deck. You’re better off playing these on turn 3 so you can play the Peddler along with the extra 1 mana option available for something like a Voidwalker or a Flaming Imp. The Grand Tournament Update: This expansion brought a few new cards that can be substituted into the deck. Gormok the Impaler rewards you for overflowing the board by providing you with 4 damage that can be pointed to opposing minions (or your opponent). Wrathguard is a class card with high reward and a painful risk. Playable in the early stages of a match but gets a little less valuable as the game progresses and as your health gradually falls. Dreadsteed is a recurring annoyance but the deck would have to change a little more in order to accommodate this 1/1. You can sub out 1 Sea Giant for Gormok and both Voidcallers for a Wrathguard. For added burst, toss Mal’ganis and put in Leeroy Jenkins. The great thing about the mulligan for Zoo is the seeming ability to almost never draw a bad hand. Similar to Face hunter in that regard, many of the cards in the deck are cheap in the mana cost department. Even then, if you do end up with a sub-optimal hand, the Lifetap hero power presents you with additional options at the cost of being able to do much of anything on the same turn. Odds are if you need to burn a Lifetap early in the game, you’re going to lose. Look for Flame Imp, Voidwalker, Haunted Creepers, Dire Wolf Alpha, or Knife Jugglers in your opening hands. Nerubian Eggs are okay, especially if you happen to find yourself holding a Power Overwhelming or a Dire Wolf Alpha. Personally, I love being on the draw and having the coin, as I can possibly open with two minions. There’s been many games where I play a turn 1 Nerubian Egg with a coin, while following it up next turn with a Voidwalker and an Abusive Sergeant on the egg in order to turn it into a giant spider — and the Voidwalker can protect it allowing you to score unanswered hits into your opponent. Make smart trades against your opponent’s early minions in a bid to establish board supremacy. You’ll eventually win out on card advantage with Life Tap later on in the game. Start vying for control of the board! You have a few removal options. Your Power Overwhelming can sacrifice one of your minions into threats on the board. Alternatively, you have Imp-losion that can do a variable 2-4 damage, which can then be followed up with by one of your other minions on the board, hopefully. A Knife Juggler in play at the time of the Imp-losion will give you some extreme value if he lives that long and might even soften up additional minions for you. Optional: You can include a lone Big Game Hunter in the deck to help you blow up any bigger minions from your opponent, but that’s the only one you get, so use it sparingly. Some lists I see have automatically included one in lieu of the second Voidwalker. If you can engineer your Voidcaller out so that it can get a Doomguard or Mal’ganis in play earlier, you’ll be in excellent shape. You might find yourself with a Power Overwhelming and a Void Terror in hand. If you see an opportunity to Power Overwhelming one of your minions and pop a Void Terror next to it in order to eat it, you better do it! Against reset cards — cards that can wipe your board, make a note as to what your opponent is playing and then plan as though the game will reach a point that they will cast the spell. You can’t play around a Flamestrike, as 4 damage will incinerate most of your minions, so any Deathrattle minions in play should be left in that state as insurance. Against a paladin, try to keep your minions above 2 health to avoid their Consecration. Same deal with hunters and their Explosive Traps. Your heavy hitters are Doomguards, Sea Giants, or Mal’ganis-buffed demons. If you don’t have board control by this point, then the game’s lost. But seriously, the end game stage of this match up involves getting your heavy artillery out and closing the match. Power Overwhelming has been used as a finisher ever since the old Soulfire nerf. The swing cards in the existing deck are Void Terror, the second Dire Wolf Alpha, and the second Sea Giant. I threw in the Soulfire because I figured not everyone has access to some of the more powerful cards in the deck, and it serves as a functional replacement. This deck only runs one Flame Imp because I’ve found having two can be rather painful and self-defeating, but I’ve listed one anyway. It all depends on what class your opponent is playing. 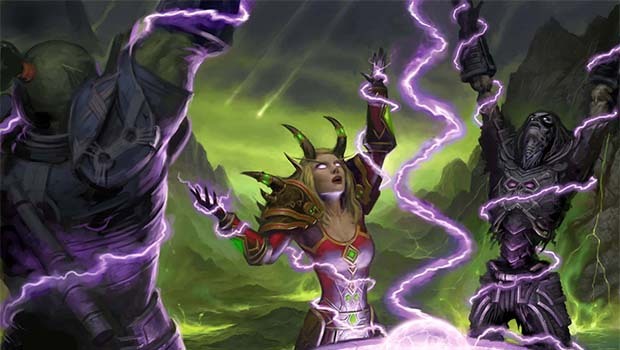 Sylvanas fits the midrange control theme well, and functions as an on-demand Mind Control with a Power Overwhelming. Kezan Mystic should be self explanatory, and tip the scales further in your favor when you play against hunters or mages. Bane of Doom helps with extra removal, and the Piloted Shredder is suggested in case you need a little more resiliency on the board. Druid: Swipes are your biggest enemy here so try to keep your minions above 1 health. With your Nerubian Eggs, you want them activated quickly. All it takes is one Keeper of the Grove to completely nullify that minion. Don’t Lifetap so hard that it’ll put you in range of a Savage Roar and Force of Nature combo. Hunter: In theory, this is a matchup that could go either way. The problem is that their hero power and your hero power both deal damage to you. You have to respect and assume that they’re playing Face Hunter. Trade those minions smartly, and they’ll eventually run out of steam. If you determine that you’re squaring off against the Hybrid or Midrange hunter, a Knife Juggler into an Unleash the Hounds can spell danger for you. Don’t flood the board too much if you can help it. Mage: Odds are you’ll be squaring off against Tempo, Freeze, or Mech mage. The Mechs have largely fallen out of favor now. You actually might want to consider teching in a Kezan Mystic just to increase your odds a little more. Flamewaker’s rise means a huge annoyance for you since every spell cast potentially fries one of your minions. Don’t Lifetap too much or else you might fall into range of the Freeze mage’s ordinance of damage spells. Paladin: Settle in for the long haul, as their bevy of healing spells and minions are enough to cause this match to go the distance. Plan for eventual Tirion removal. Again, watch out for Consecration. Priest: All it takes is one Deathlord and you’re stalled. Having an Ironbeak Owl around will help you get around it, but it still has the ability to systematically eliminate your minions (and I’ve seen Deathlords go 1 for 4). Rogue: I hate Miracle rogues. Their burst potential is so high. Blade Flurry can stymie your offense in an instant. Don’t activate your Deathrattle minions to account for the Blade Flurry. Rush them down, fast! Shaman: Haven’t encountered too many shaman players recently, but Mech shaman is the closest consistent deck I’ve seen during my ladder run this month. Keep your Eggs and Creepers out unactivated so that a Lightning Storm won’t hurt you too bad. Warlock: In the mirror matchup, whoever draws into and plays their Sea Giant first will typically win. With all those minions hitting the board from both warlocks, the Giant will be extremely cheap to put into play. Warrior: Patron warrior decks are the deck to beat right now. Exercise caution when using Imp-losion or getting extra Imps out via Imp Gang Boss. One Warsong Commander coupled with a Grim Patron, and you’ll be left to watch in despair as their board multiplies. Rush them down fast before they even reach that point. Catch Matticus every Friday night at 8 PM Central as he streams Hearthstone playing the decks that you want to see on the Blizzard Watch Twitch channel!